Using shapes from the AccuQuilt GO! 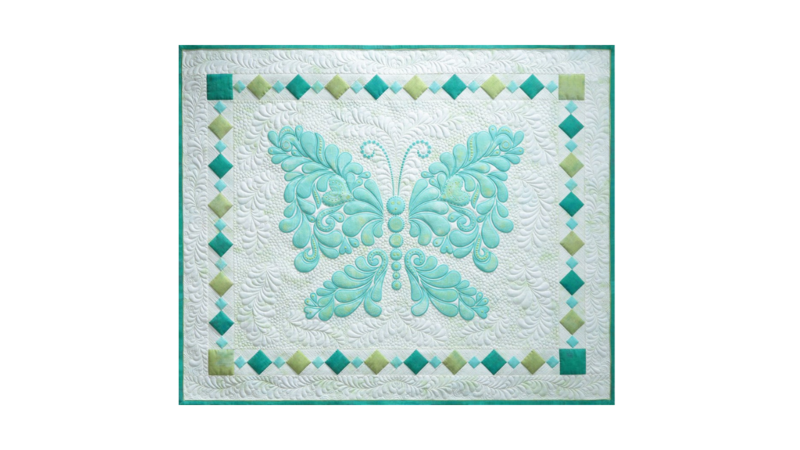 Heather Feather #1, Heather Feather #2 and Heather Feather Border dies, The Butterfly is a work of art that you'll want to create to display in your home. Exquisite stitching detail on the embroidered appliqué shapes draws you in to take a closer look. The Butterfly 100 design measures 28.77" x 21.99"
The Butterfly 70 design measures 20.15" x 15.40"
All appliqué shapes can be cut with the SVG files included and your favorite electronic cutting machine. The Butterfly 50 design measures 14.37" x 10.99"